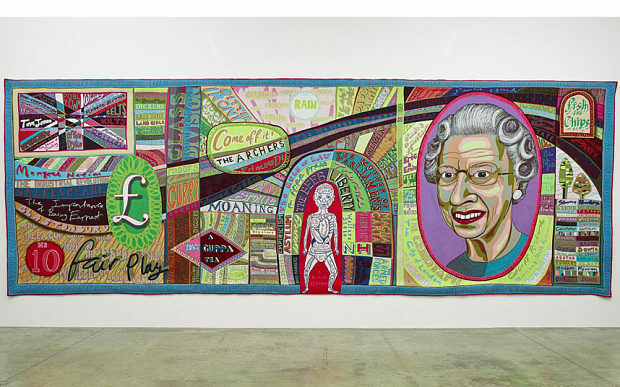 ‘Who are you?’ is the most recent exhibition at the National Portrait Gallery displaying fourteen portraits by Turner Prize winning artist, Grayson Perry. The sculptures, pots and tapestries were featured in the Channel 4 documentary series, in which Perry interviewed and explored the lives of a variety of people from different backgrounds and circumstances. These included politician Chris Huhne, an adoptive family, and a community of deaf people. Among these works were sculptures of women, proud of their size, a miniature portrait of Ryland from X factor, and a silk hijab about a woman’s decision to convert to Islam. As well as this range of pieces exploring how fascinating a person’s identity is. In particular, the heartfelt pots reflecting a couple’s struggle with dementia and a bronze sculpture of a transgender man in the form of Peter Pan, stood out among the rest of the pieces. When visiting the exhibition, you notice the strangeness of the artworks being displayed among busts of lords and important figures, which really makes the viewer ask the question why shouldn’t there be portraits of ordinary people, those from poorer backgrounds or people struggling with aspects of their identity? In the documentary, Perry comments that most portraits in the gallery, particularly in this section, are of people of importance, and more specifically, upper class heterosexual white men. However, he introduces a diverse range of portraits of people from many different parts of society. The exhibition looks at identity in its many shapes, forms and materials, and gets us to ask ourselves, who are we? This exhibition is now closed but the National Portrait Gallery is full of wonderful portraits from medieval times until the modern day. It is free and is open daily from 10 – 6. Next Post So what is Art History?